Quasco is a provider of concrete rubblizing and concrete breaking services and equipment. Quasco’s industry leading “resonating beam” technology breaks concrete into uniform particle sizes down to 6 inches and de-bonds re-bar and wire mesh for better removal. Quasco’s resonant rubblizing process provides many benefits versus other methods of road rehabilitation such as crack and seat or remove and replace of a concrete surface. Our machines produce results in 1/2 of the time compared to typical concrete replacement. 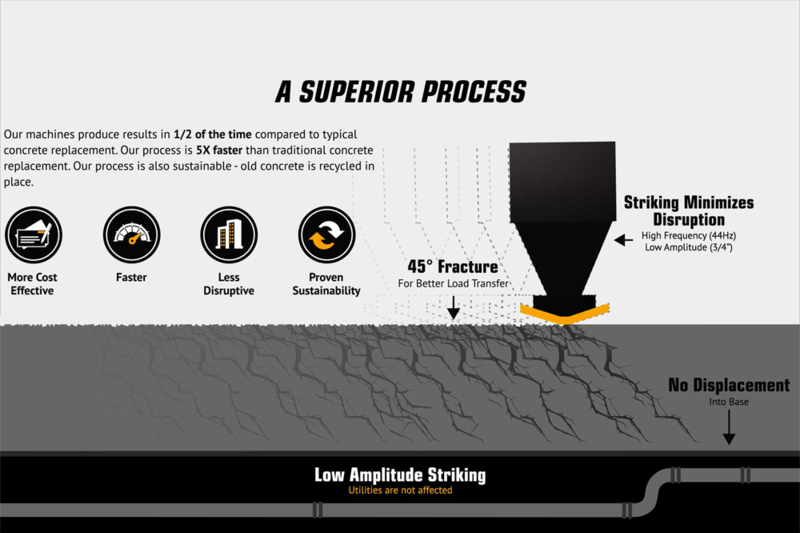 Our process is 5X faster than traditional concrete replacement. Our process is also sustainable - old concrete is recycled in place.